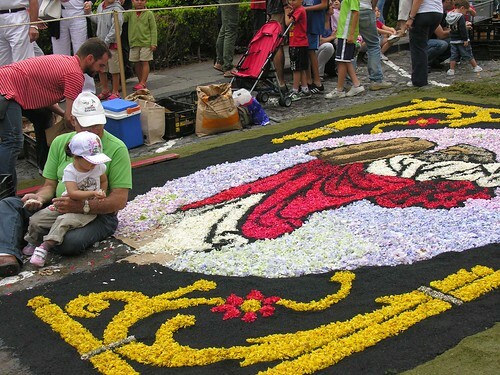 Grain by grain, petal by petal, families came together to piece together this years stunning collection of street carpets in the heart of La Orotava. Not even an unusually cloudy and moist day could dampen the enthusiasm of the annual devotion to the Corpus Christi celebrations. 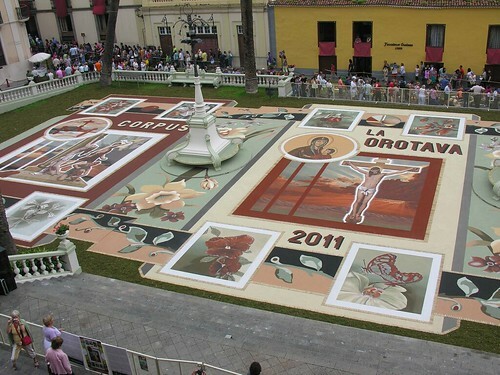 The huge central tapestry in the Plaza del Ayuntamiento had already been completed over 55 days with coloured sand and now the streets were being transformed into a blaze of colour like a living jigsaw. Leaving the scorching south of Los Cristianos early I headed to Puerto de la Cruz on the 343 Titsa bus, I thought it would be packed with other carpet baggers but it was only half full. Reading the paper I saw that flights had been diveted the previous day from Los Rodeos airport in the north of Tenerife and as is so often the case the cloud got lower and thicker as the bus reached it, worse than I have seen for a long time. It was better into Puerto but swapping onto a La Orotava link of 10 minutes it got thicker again and was almost chilly when I got out. There was a good stream of people heading for the heart of the town but I thought there was more tatt and stalls on sale than at my last carpet trip 2 years ago. Soon I was stood behind two short nuns shuffling up the stairs of the Ayuntamiento (council)Â building to get a view from the balconies of the main display in the plaza below. Some one trod on my sore toe during the jockeying for a good position, I uttered one rude word in English, thankfully the nuns were oblivious, I didn’t want to start a religious outrage so early in the day. The tapestries were as awesome as ever and at first glance you would think they were painted rather than made with millions of grains of coloured sand placed over a template. The streams of visitors below looked endless and the sky still looked grey but I could see some people up the tower of the church and made a mental note to try to scale that vantage point myself. Everyone was so enchanted with the plaza carpets they paid little attention to the splendour of the council chambers, glittering chandeliers, expensive looking paintings and religious sculptures all jostled for my interest but they were not the stars today. Back out on the street I joined the slow march upward along one pavement as other passed back on the other side, all admiring the developing masterpieces on the road between. 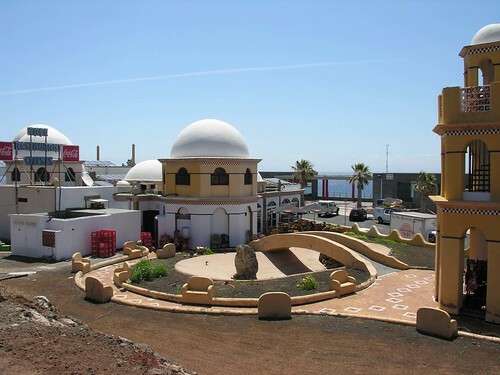 The main plaza is always completed in advance and the surrounding streets on the big day, many families have been involved for several generations and it was good to see young children learning the craft at their parents sides. 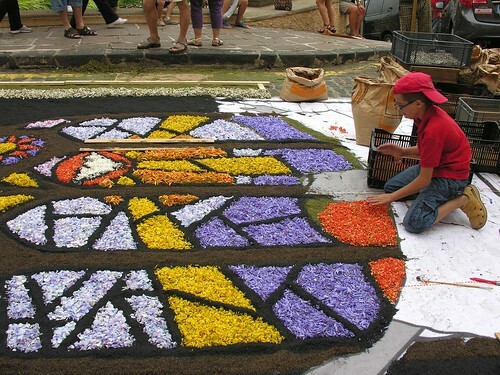 Wooden frames are used for guidance but the measuring out and sprinkling of dried petals and sand is a skillful process that is carried out with precision. I tried to be tactful as I took photos and avoided making too many large bottoms semi famous. 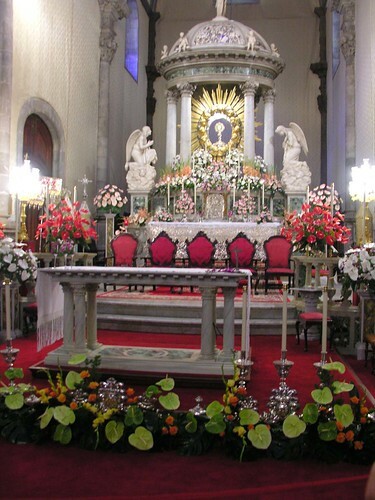 The streets wound round and down again towards the Church of the ConcepcionÂ so I went inside to marvel at the structure and decoration of the church that was built in 1788. Just like 2 years ago some young boys were left to guard the locked door up to the tower and were only letting family through, looked like they had a huge family, I offered to marry their sister but they didn’t go for that and I never got my birds eye view. Back outside their was definately fine drizzle in the air but it didn’t make much difference to the celebrations as people began to dance to guitars and drums. The day would stretch on for a lot longer until the evening procession marched all over the hard work and destroyed the carpets, no one minds their achievements have already been recognised. 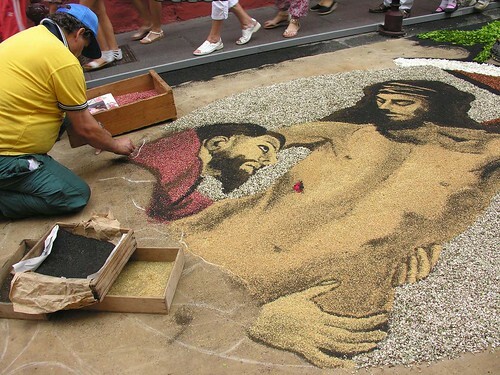 Another tradition is being passed on in safe hands. 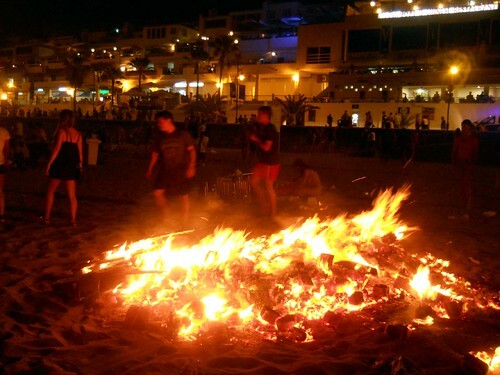 On the day Tenerife bursts into flames on the beaches around the coast, the government issued a ban on fires and BBQ’s in the hills due to the heatwave that is roasting the island. 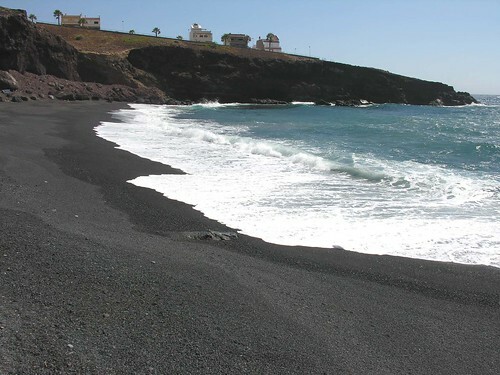 Well it has been hot, very hot, at the beach in the afternoon it had slipped to a chilly 31 degrees but even as I headed down to Los Cristianos beaches again at 10.30 pm it was still reading 24 degrees. Noche de San Juan is our own little bit of mid summer madness and with the weather so hot there was a bumper beach bonanza this year. I met some Armada Sur friends Dave and Annie near the old beach and the promenade was packed with the dedicated and the curious. 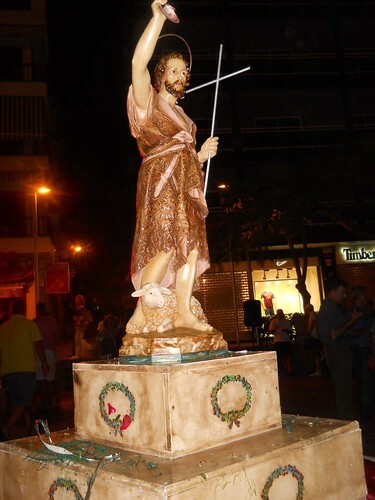 The statue of San Juan, or Saint John to his close friends, had been carried down a little earlier and was holding court at the Plaza del Pescadora in front of tables serving tapas and a large music system pumping out variations on Canarian dance tunes. Some people carried flowers ready to cast on the sea, just one way to symbolize cleansing the bad and wishing for better in the year ahead. As we walked through the tunnel to Las Vistas beach we left behind one large bonfire burning brightly on the old beach, already several splinter fires were being set up in the sand as focal points for families and their nocturnal picnics. 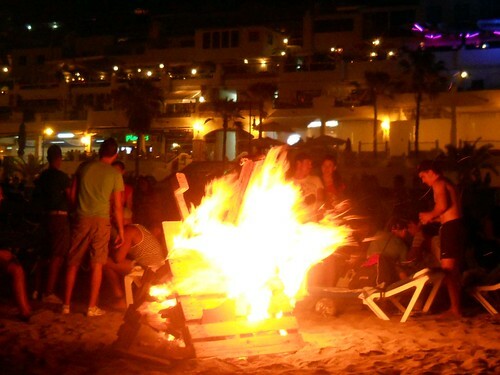 On the bigger beach the flames of several large fires were licking at the night sky as young revellers streamed down the steps from San Telmo armed with bundles of card for fuel, and of course the inevitable clinking carrier bags of cheap beer and spirits. Not wanting to be left out we stopped at Goodfellas bar, nicely positioned at the centre of the promenade with good views of the teaming mass of half dressed bodies dancing on the beach. Taking a few cool Doradas we were joined by another Armada Sur couple Ian and Janette and chatted as we watched the sights go by, many were hopping over the wall onto the sand where some were making close runs through the very edges of the flames. On the beach some larger parties had set up stashes of booze and were clearly in for the duration, others were dancing to radios or scoffing. 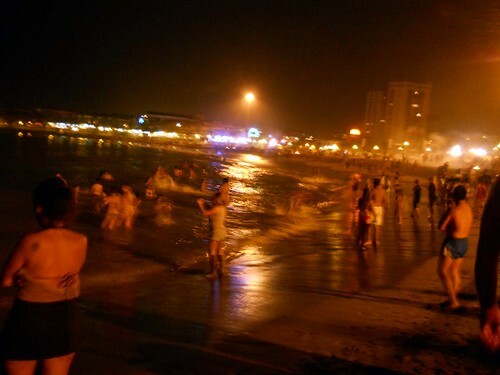 With midnight approaching I made my excuses and hit the sand wending my way through the gathered groups to the shore to see people running into the waves, some fully clothed. Normally people make small fires from a few sticks and jump them while making a wish but the cooling sea was the main attraction this year. I was wearing my CD Tenerife shirt and had a few drinks forced down my gullet, honest I didn’t want them. To a thirsty football fan the white domes of the Oasis restaurant mean a welcome beer stop half way up the TF1 motorway to Santa Cruz. 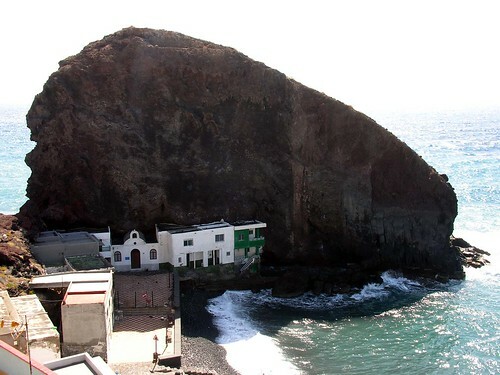 During the season I stop there every 2 weeks in the company of the Armada Sur as we go to worship CD Tenerife but I have never gone down below the Oasis to check out Los Roques a small historic village that is hoping for a revivial in fortunes. The recent elections have brought a new mayor for Fasnia the region where Los Roques is situated, and Damien Perez has vowed to restore this area to its sparkling rugged best. 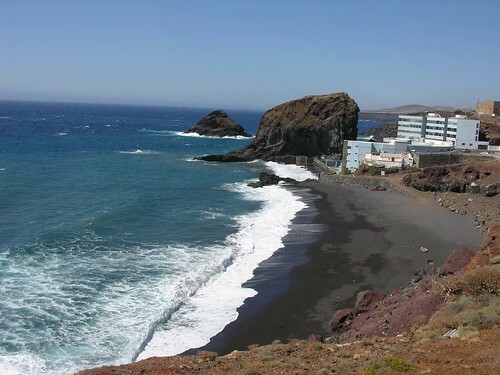 I headed down the winding road to the coast below and found a choice awaited me, to the north Playa del Abrigo and to the south Playa de Los Roques. Taking the Playa del Abrigo path I soon got the full benefit of the large dark sand and shingle bay, on a scorching day with lively waves there were just two people bathing on the beach. 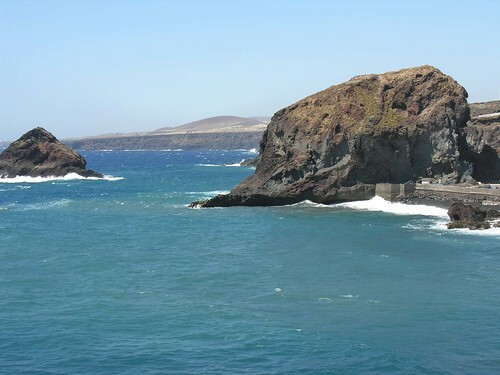 Walking to the far end I looked across the beach to the two rocks that give the area its name, the largest is attached to the mainland and the second is a small volcanic spit a few yards away. Tucked in behind the main rock are the Bahia Apartments, an early attempt to atrract tourism, built in 1964 they look run down now but it looks like there are still people living there. Moving closer I could see a neglected swimming pool near the beach and a blocked pathway where the sea laps close at high tide. There used to be a passage way through here linking the two beaches and the new mayor intends to restore this and improve the main beach. On this side of Los Roques there are some modern new apartmenrts and houses, the regeneration of Los Roques seems to have been a very sporadic affair. Looking up I could see the empty local opposite the Oasis, it has been a work in progress for around four years and is partly fitted out as another restaurant and bar, the views from the terrace would give an uninterrupted vista of the beachand the roaring sea. 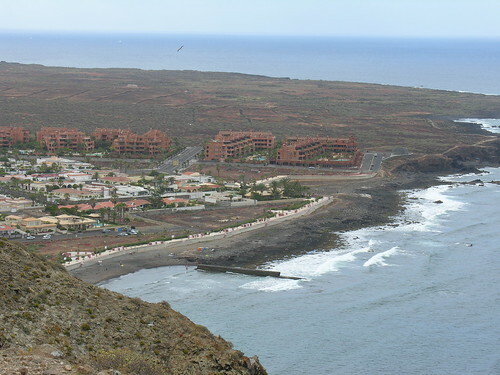 Back tracking up the hill and taking the other path to Playa de Los Roques I found a much more traditional fishing village that had clearly seen better times. On this other side the old village is pressed against the base of the rock and includes a small church. 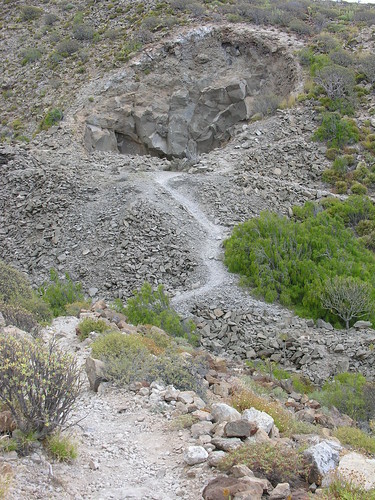 In it’s day this was a busy area, a large cave of salt deposits Cuevea de La Sal was used to preserve and prepare potatoes for a sea crossing to Gran Canaria. A closer view of the smaller rock revealed that it was teaming with bird life, this is such a vibrant stretch of the coast. A large levelled area makes a handy natural car park, maybe at weekends people flock down to swim at the main beach but somehow I feel it is still a hidden gem. The Oasis above is just a baby, born in 1998, but is a well visited stop off point. It’s strange to think that most people popping in to quench their thirst are unaware of the splendour of the landscape that unfolds just below. Hopefully the mayor will fulfill his promises and restore some pride to Los Roques. There I was getting my hopes up at the chance of watching the 1930 World Cup in Tenerife. Have I finally flipped, or is it the latest bizarre ruling from FIFA, well neither really, today was the first day of filming in La Laguna of Montevideo, a movie about the first ever World Cup that took place in the Uruguay capital all those years ago. It’s a Serbian production based on the true story of the surprise packet of the tournament, Yugoslavia, they only went to make up the numbers but their mainly Serbian team finished third. This is the second movie now going into production, the first showed the players growing up and sharing their love of football in their home town of Belgrade. The new movie takes the story on to their World Cup exploits and will be followed by a TV series, apparently this has become a huge hit with the Serbian viewers. La Laguna is doubling up as 1930’s Montevideo but I was hoping the action scenes would be filmed at CD Tenerife’s Heliodoro Stadium in Santa Cruz. Sadly it is not considered big enough to depict the games, the final when Uruguay beat Argentina 4-2 was watched by 93,000 fans. Seems a shame as the Heliodoro is quite an old stadium and with some technical wizardry I’m sure they could add on a few tiers to the stands. 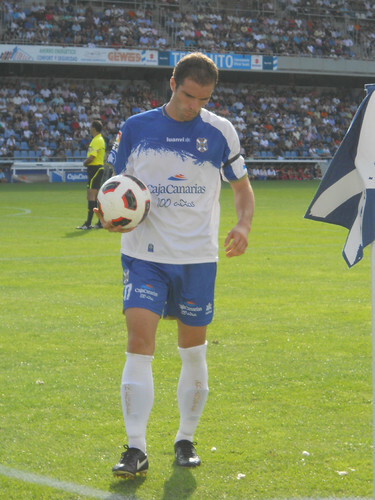 CD Tenerife even had a Serbian forward a few years ago, Vejiko Paunavic, but he is now playing in the United States. 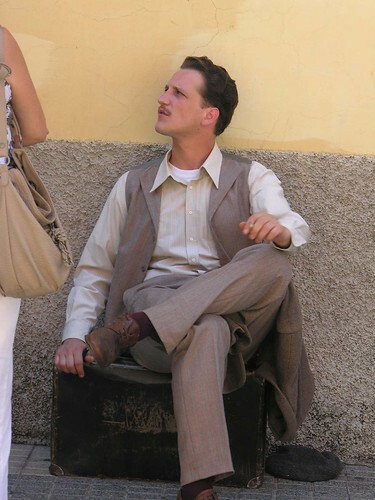 It looked like the film team were digging in for a long shoot up by Calle San Agustin, actors were getting into 1930’s clothes in the caravans provided, a large catering unit was in place to feed the crew and stars, and a large dining area had been set up in the shade. The security guard hovering around wasn’t too keen on my camera but it is in a very public area so ya boo to him. So much for my trip back in time to a golden age of football, I will just have to re-create the 1930 games with my Subbuteo players. Plaza Weyler in Santa Cruz is often the starting point for protest marches but this Sunday 19 June could see one of the biggest yet. Madrid was the birthplace of the 15M protest that started in Puerta del Sol on 15 May with thousands camping peacefully for weeks to protest at the greed and corruption of politicians and bankers that is being felt by the poorest in society. 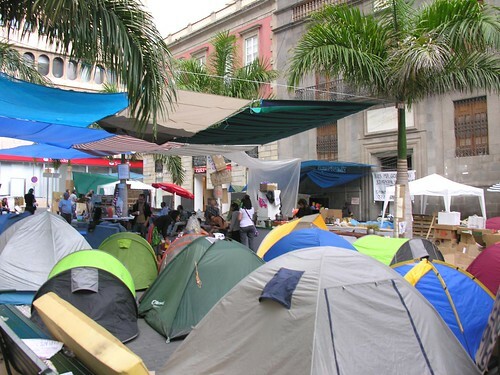 A couple of weeks ago I was up in Tenerifeâ€™s capital Santa Cruz and saw our own Acampada in Plaza de Candelaria. It was a big site made up of tents, workshops, kitchens, and even Radio 15M a rebel broadcast station. Ok it was small compared to the Madrid version and the many others that spread across Spain but still significant. The camps have started closing down now, in Madrid they are melting away but leaving a small presence. Last Saturday the police went in to clear Plaza de Candelaria, itâ€™s remarkable they have been so unusually restrained over the weeks, local press reports say 5 people needed hospital treatment, the first alleged violence surrounding this protest. 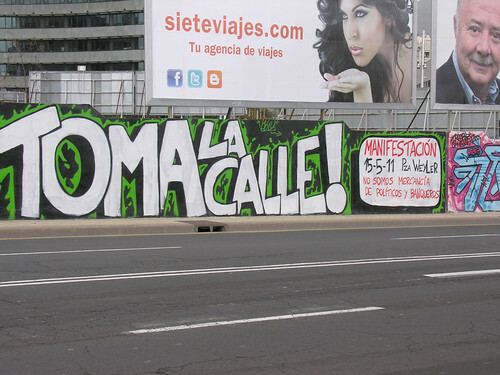 Posters have been going up the last few days for this Toma La Calle (take the street) protest this Sunday at 6pm. Over on the mainland marches are due to start in major cities also on Sunday to slowly converge on Madrid for 17 July. People are getting angry, they see the leaders, politicians and bankers playing Monopoly with the economy, losing a fortune and then telling the people they serve to tighten their belts a bit more to pay for it. Iâ€™m surprised there has not been more revolution in the UK, everyday the news is full of more jobs being slashed and pensions being cut at the same time as big companies hike prices (19% gas increase) to feed the ever rising packages of their directors. Teachers are now threatening to strike in the UK to protest at their pensions being cut back, I just saw an MP on the news spluttering about how outrageous it is â€“ nothing wrong with fiddling expenses of course. Iâ€™m sure the teachers and many others were as impressed as I was yesterday to see former Marks and Spencer boss Stuart Rose on the news proudly saying he deserved his 8.1 million golden handshake when leaving his job â€“ more like a golden 2 fingers to everyone else. Maybe the recent uprisings in oppressive countries around the world has shown people that they can change. Power to the people as Wolfie Smith used to say. 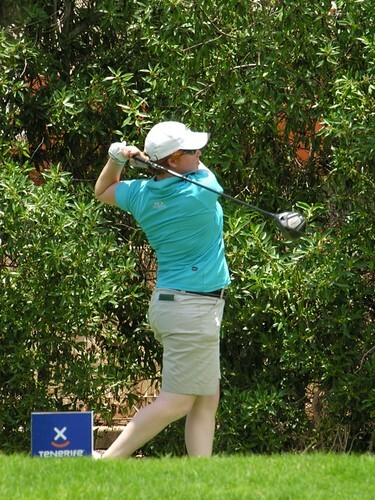 There will be parties in the streets of St Asaph in North Wales tonight after Becky Brewerton won the Tenerife Ladies Match Play at Golf Las Americas. 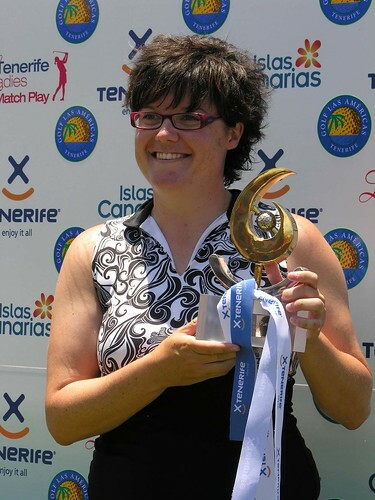 It was a nail biting finish for Becky, three times a runner up in Tenerife, she couldn’t watch her chasing rivals Nikki Garrett of Australia and Carlota Ciganda of Spain at the final hole but they both fell just short to share second place. It was another scorcher for the final, I had done extensive research, well if you count looking up the calendar shots that Danielle Montgomery (below) posed for a while ago. There wasn’t an official category in the competition but I reckon the winner of the Pro Am on Thursday definitely had the finest legs in the tournament. On my arrival I was glad to see more spectators than on my Friday visit, after all it was a top European ranked sports event and FREE to watch. The previous two days match play had cut the field down to the last eight players for a traditional round of stroke play and I joined the leading pair at the 10th hole. Danielle was indeed looking delightful but this was serious stuff as they chased the 40,000 euro prize. Wales had a double chance with Lydia Hall in the running and American born Australian Frances Bondad (below) was a surprise packet as she made her presence felt. As the spectators swarmed after the players and the watching television cameras presented a living holiday brochure to the world and the ducks and swans were preening themselves hoping for a part in David Attenborough’s next series. Jumping the brook a few times without making a wet fool of myself I managed to get up to the head of the parade as Becky and Frances reached the 18th green and the Welsh wizard finished on 68 shots, four below par. Now it was a waiting game to see how close the other players could get. We didn’t have long to wait, Nikki Garrett (above purple) and Carlota Ciganda (above pink) , in her first professional event, were snapping at Beckys score as they arrived at the final hole. Tension was high as Carlotas second shot plopped in the water and Nikki just missed a 15 foot putt, both were killer blows. The smile on Beckys face said it all, there was a long hot wait for the officials to set up the presentation area but everyone got their deserved thanks for a well run event. Becky received her bottle of champagne and made a bee line for Shane her Irish caddie to give him a good soaking. Roll on next year. Not a string vest or knotted hanky in sight just young enthusiastic local models and a selection of clothes and accessories from shops close to the catwalk. Plaza del Pescadora looked Absolutely Fabulous as fashion took centre stage at Los Cristianos old beach last night with two shows. On the way down I passed children sitting for face painting at one stall and free make overs outside the Mego perfume store, luckily for them I didn’t set them the ultimate challenge. Arriving at the stage area Mickey and Minnie Mouse were parading and entertaining the crowd of families and holiday makers. I was surprised to see security staff at each end of the catwalk, maybe Minnie Mouse had heard that Ryan Giggs was on the prowl. The shows were organised by the local business association to boost trade, an excellent idea, just a pity it was only advertised in the immediate area. Once the cartoon heroes had departed the compare took the microphone and invited the first models to hit the catwalk from their impromptu back stage dressing rooms. Each group of models showcased the stock of a different shop, many were for youth fashion but there was also emphasis on glasses, shoes and bags. For some strange reason my photos have captured mainly the ladies but there were some male models too. All were volunteers from local schools and colleges, fair play to the young chaps for running the gauntlet of their teenage friends in the crowd. There was a section for toddlers that was packed with the aaah factor. The first boy and girl were quite happy and revelled in the attention but the next couple had a difference of outlook. The little girl was ready to stride out and milk the crowd but the boy got an attack of shyness and was rooted to the spot fighting back the tears. After a lot of coaxing, cheering, steering, and almost dragging by the much keener girl he did take a bow, the applause was warm and very loud. After starting as a clear sunny day the clouds had appeared for the 6.30 pm first show but the spotlights were all rigged, the sound system ensured music and commentary for all and the video wall turned the models into giants and made sure everyone knew where they could buy the fashion items. A well presented show with some very plucky models but a bigger crowd would have enjoyed it if the advertising had been aimed further afield and in a range of languages. There are two more parades tonight (Saturday) at 6.30 pm and 8.30 pm, try to catch them. You can see more photos here. I’m surprised I’m allowed on a golf course after the amount of balls I redistributed from the course in Oxford not far from my home. It was a sort of service that a few of us young lads carried out, wading through the brook in wellies and pearl diving for barely damaged chunky white golf balls before selling them on to keen local players. Obviously it’s not rated as a deadly sin and I’m not on a computer bad boy list, just as well as my work takes me to many of the splendid golf courses around Tenerife. Today was the opening day of the Tenerife Ladies Match Play at Golf Las Americas so I popped in as Tenerife Magazine are an official media partner for this years event. It was nice to walk down the Calle Llanos de Troya at the side of the ground without being accosted by young professional ladies, when we get dropped of their from football trips late evening they are always plying their trade. I don’t mind the accosting so much but wish they would stop saying Hello Mr Colin, the usual sir? Anyway walking under the television crane on the entry to the club house reminded me of the huge international media interest in this European Tour Event. After saying my hellos I set off around the course to see which players I could catch up with. As luck would have it at the 11th hole I found Felicity Johnson (top pic) squaring off against Krystle Caithness of Scotland. 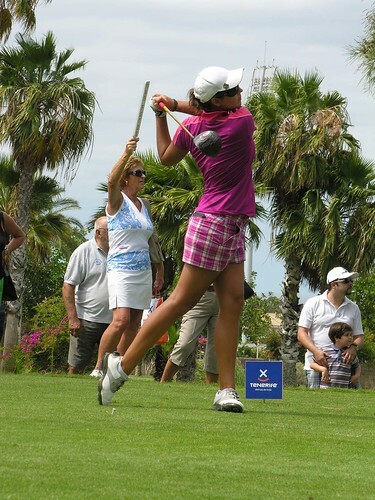 I followed (not in a stalking way) Felicity on the final day at Golf Costa Adeje 2 years ago when she won the Tenerife Ladies Open, as it was then called. The Aston Villa fanatic was in good form and eventually knocked her opponent out of this years competition to progress to the final 16. 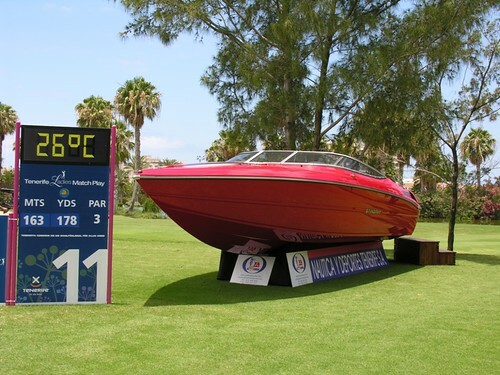 Lingering at the hole I wondered what sort of vandal would drag a throbbing red Stingray SX speedboat onto the course and dump it by the green. Then I realised it was the prize for getting a hole in one at that particular hole, pretty nifty eh. Last years winner Trish Johnson (above purple and pensive) soon followed down to the green with her opposite number Stacey KeatingÂ (below)from Australia. Bristol girl Trish was having a bad day at the office on her way to being eliminated. The ladies had started at 8.30 am and were whizzing through the action, I wandered off and managed to see Stacey Lee Bregman from South Africa as she disposed of Jenni Kuosa of Finland. The intense heat remained as the cloud rolled in to cover the sun and with the buggys bouncing their way back to the clubhouse I took a long leisurely stroll to explore the lakes and rivers that make this such a lovely course. The swans and ducks seemed unbothered by all the flurry of attention, there weren’t many spectators on course but hopefully it will pick up on Saturday and Sunday as people log off from work. Hopefully I will be able to bag a few pics of the winning player on Sunday. Four more debuts for players from the B team, and a squad with 10 Canarian born players, that must be the green shoots of hope for the future of CD Tenerife. Sadly our head gardener and President is already threatening to stamp all over next seasons chances of growth. Derby day at Las Palmas closed the season and although a 1-0 defeat to a penalty gave the Pios a chance to gloat even they must realise it was a hollow victory. Some of the soon to depart were left out of the squad, in came Jesus at left back, Bruno at right back and Abel in the midfield, all did well and later Juan Ramon got a couple of minutes as the game drew to a close. For all their promise these young players will need a few old wise heads to guide them on the pitch, step forward two great role models, Mikel Alonso (above) and Sergio Aragoneses, both had outstanding games. President Concepcion has got the club in such a financial tangle that it threatens to strangle the life out of it and despite the midfielder and goalie wanting to stay on at reduced terms, the club is pushing them out of the door. Meanwhile back in Pio land Sicila and Omar picked up knocks in the first 20 minutes and limped off putting more pressure on the mainly inexperienced side. The referee dealt a cruel blow after 26 minutes awarding a penalty even though the foul by Ricardo looked just outside the area. 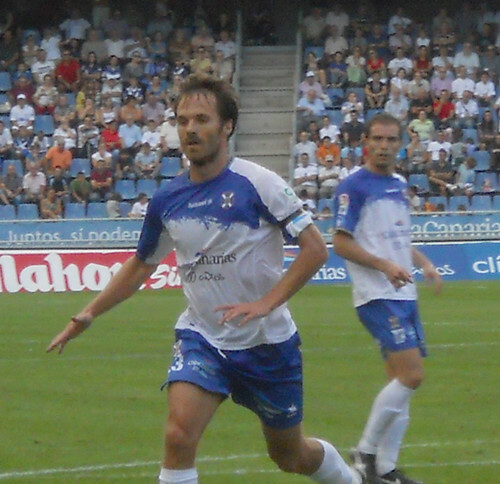 Suarez made it 1-0 but Tenerife were giving a , good account of themselves with just the final touch letting them down. With Nino now a fond memory German had a lot to do, sub Juanlu (below) put in a great free kick cross just before the break but no one could get a head on it and the ball went out of play thanks to a push on from the home keeper. The corner served up another chance but German shot wide. Mikel was full of fire and ideas in the first half and Sergio looked his usual confident self in goal but was even better in the second opening with a fine tip over the bar from a Pio shot. I couldnâ€™t help chuckling when Luna got booked and the caption said he would miss his next game â€“ a nice welcome present to his next club. Suarez was always dangerous for Las Palmas and slipped the Tenerife defence only to find Sergio ready for him with a one handed save. Quero tried his luck but the unsighted Sergio got his fingers to that shot as well, the best was to follow as he pulled off two quick reflex saves in succession, one from an overhead kick â€“ sheer class. The Pios had another penalty awarded, this one more obvious as Prieto fouled in the box, Josico stepped up and found out for himself that Sergio was on top form. Juanlu slung in another tempting cross, Mikel got to it but his shot hit the home keeper in the wedding tackle. It could have been a shared result but Juanlu couldnâ€™t put any power into his last minute shot. Itâ€™s going to be a long summer as the club juggles to pay off the players wages and possibly coach Amarals contract while trying to inspire some confidence for the start of Segunda B. All dressed up an nowhere to walk, well not strictly true; I rarely dress up but had made some dainty cheese rolls and loaded up with water ready for a Saturday morning walk. 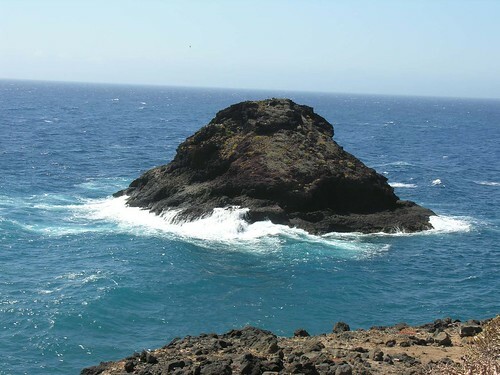 Sadly only 2 people showed at the usual Apolo centre start point and they took the hint to do something else but with my toes twitching I headed down to Playa de Callao at the market end of Los Cristianos to renew acquaintance with MontaÃ±a Guaza. Probably the toughest part of this walk is the steep tight twisting path that looks a lot easier from down below. Once I got on the staircase I was reminded of how hard and angular the surface is and how some of the looser stones tend to shift below the feet. A few water swigs later I had reached the top and was up onto the plateau with the flat dry grassy fields stretching out ahead of me. 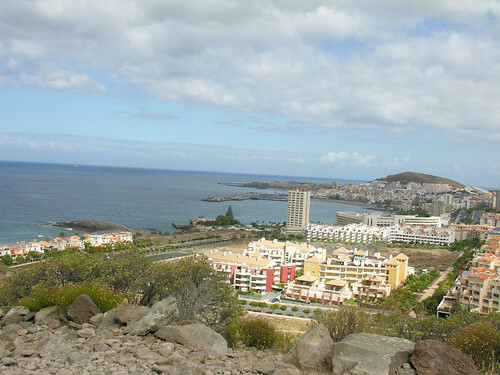 The sun was playing hide and seek behind grey clouds but Los Cristianos was waking up nicely down at sea level and a slight breeze was very welcome. 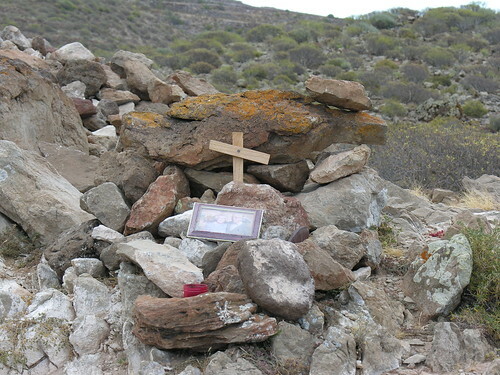 I walked out to the plateau edge just above the stairs and noticed a small wooden cross and a photo of an old couple tucked into a pile of large rocks. Maybe they were keen walkers or the family just wanted them to have a peaceful resting place with a clear view of their favourite places panning out in the distance. There are tyre tracks on the paths, a reminder that the transmitter masts at the peak receive regular visits from maintenance crew. 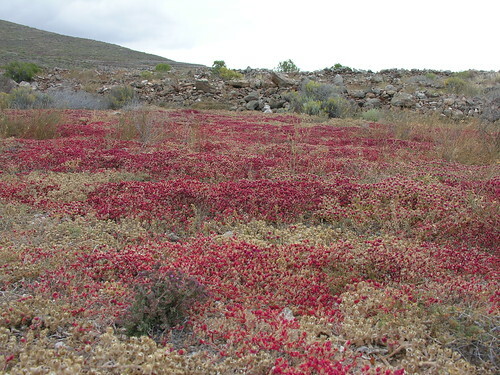 Years ago there were tobacco and tomato plantations up on the level floor stretching from the cliff tops, old stone walls remain but the only crops are short red tabaiba plants making a colourful carpet. There are several route options, usually I head up to the aerials and the peak but this time decided to head outwards to the cliffs to find the path that skirts along the edge. As I neared the cliff the silence was broken by the screech of seagulls and the lovely view was spoilt by the sight of a cluster of fish cages, what a curse they are around our shores. Taking the undulating path it dipped inland and down into the remains of a stone quarry, lots of quarrying went on at MontaÃ±a Guaza and some of the stone hewn out here was used to build the Rasca lighthouse that is visible from Los Cristianos. When Iâ€™m out enjoying a testing walk I have to watch out for the smug zone, that point where I think Iâ€™m doing well taming nature and pushing back the frontiers. Thankfully this is usually countered by the appearance of an oncoming jogger or cyclist, this time it was a young lady walking her dog with a cool relaxed air about her as she exchanged pleasantries with the blond ball of sweat panting along the path â€“ another bubble burst. Up a steep quarry side and I was at a great vantage point looking down on Palm Mar, I stopped and scoffed my warm curly rolls here very aware of the hungry seagulls wheeling in overhead. There is a route down into Palm Mar but I headed back inland looking for the path home, the masts in the distance reminded me of the route up to the peak but the cliff top walk had distracted me enough for one day. The paths werenâ€™t so clear now but I headed towards some old stone cottages knowing that would lead me back on track, and it did the trick. Taking a well worn driving track alongside the old plantations I soon found myself back at the stairway down and began a cautious descent. Going down could be even more tricky that the up walk but soon the familiar coast drew level with me and I was back on firm ground with another 3 hours plus of exercise done, time for a cold drink.